While it is extremely hard for me to believe, my oldest will be graduating high school at the end of next month. This is incredibly exciting, but it also takes my breath away. We are very fortunate that our state homeschool association offers a big graduation ceremony that you can sign up for, and he is SO excited to have a formal event for all of our family to attend. 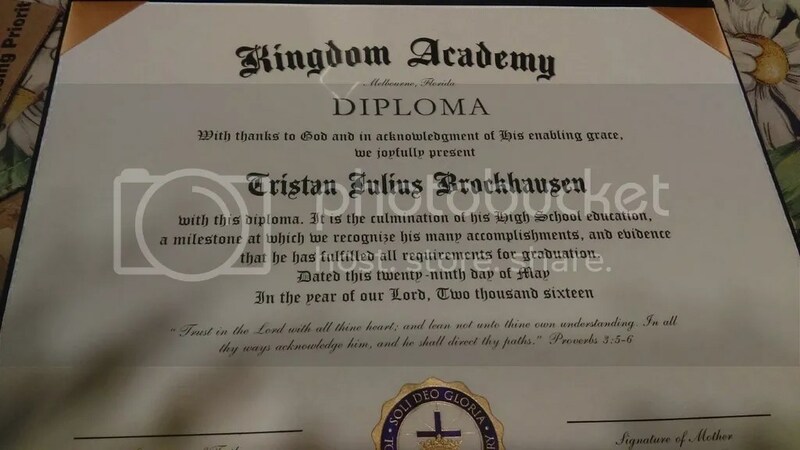 I am really excited that for this review, I got to order the Exclusive High School Diploma from HomeschoolDiploma.com to give him when he graduates. It is absolutely beautiful, and I know it is going to be a very special way to commemorate his high school journey. First of all, the Exclusive Diploma offers you a variety of options so you can totally customize the design to meet your needs. It features a thick, padded cover that looks and feels absolutely professional. You can choose from different colors like blue, green, and red, but we went with the standard black. You can also choose from four different seals to go on the front. The seals and lettering are embossed and feel really smooth when you run your hand over them. We choose the “Soli Deo Gloria” seal because we wanted something that honored the Lord, and we also liked the Latin wording. Other seals recognize private education and classical homeschooling. 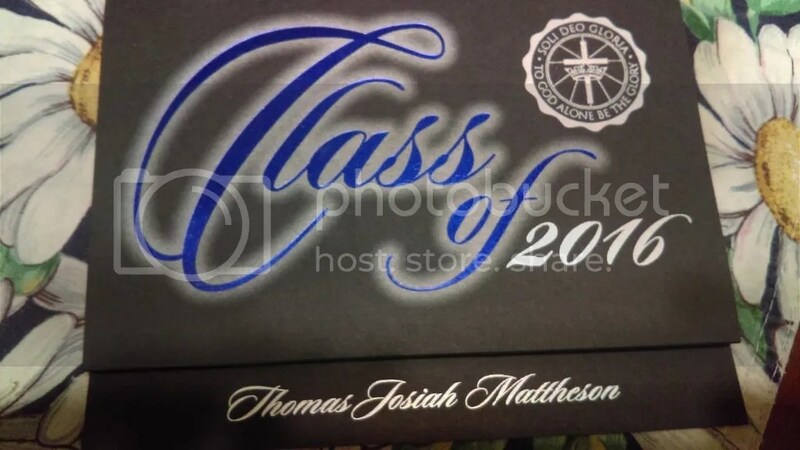 After choosing the outside, you customize the inside of your diploma with the name of your school and your student. From there, you get to decide on the wording of the diploma. The company offers four wording options, that range from standard state wording that recognizes the completion of high school, to college prep wording that acknowledges challenging coursework, to faith-based wording focused on both the student’s coursework and God’s hand in their lives. We went with the “Thanks to God” wording, because our schooling was faith-based and we wanted to express our thanks for the opportunity to school our son at home. You also get to choose another seal for the actual diploma. This one comes in full color and is gorgeous. You can choose a different seal than the one you put on the cover, but we went with the same one, and I think it’s beautiful. 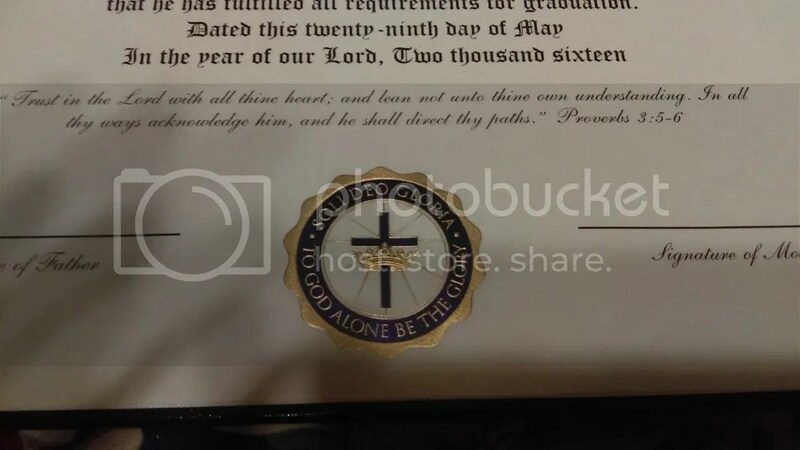 The diploma itself is printed on nice, heavy-duty paper and you get to choose between ivory parchment or cream colored stock, we went with the cream. I think it gives it a nice antique look. You can also add a verse to the diploma (we chose Proverbs 3:5-6) if you want at no extra cost. Additional options for extra fees include adding an honors designation to the diploma, printing your child’s name on the cover, illuminating the letters of the school name, and adding a tassel. We didn’t choose any of these, but I feel like, for $48.99, the diploma we got is beautiful. Honestly, when it came in the mail and I looked at it, it made me cry. HomeschoolDiploma.com does a beautiful job with these! 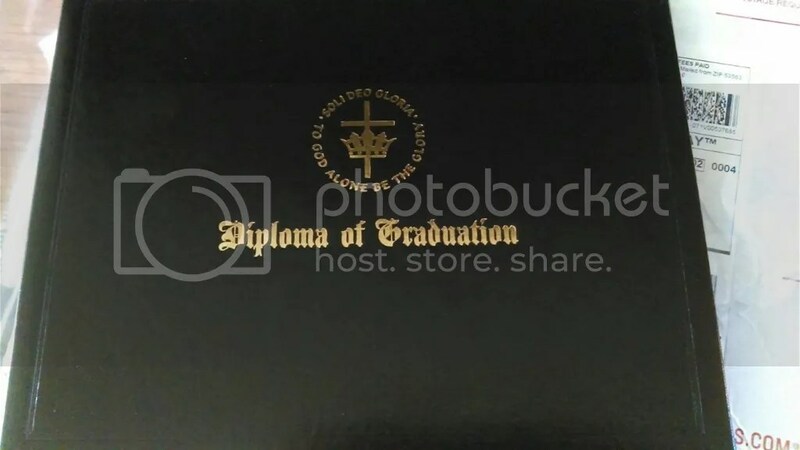 Besides the Exclusive Diploma, they also have other diplomas that start at a lower rate, and they offer a number of other items like class rings, graduation announcements, photo albums, and gifts. They sent a sample of their announcements, and I can see that the same high-quality work goes into them that goes into their diplomas. They are also printed on high-quality paper with beautiful designs, and I am really thinking about ordering some this month to send out. If you have a high school student, I would definitely suggest you take a look at what HomeschoolDiploma.com has to offer. Even if they aren’t graduating yet, bookmark their page for when the time comes. Believe me, it’s going to happen sooner then you think, and they offer amazing products for a great price! I can’t wait to watch my son cross the stage and receive his diploma. I know I’m going to cry, but that’s okay. And I’m glad he’s going to have a beautiful diploma to hang on his wall. I will definitely return to order another one in three years when his brother graduates! Posted on April 12, 2016 by brandymelissa	• This entry was posted in homeschool extras, review. Bookmark the permalink.